2019 Player Registration Now Open! 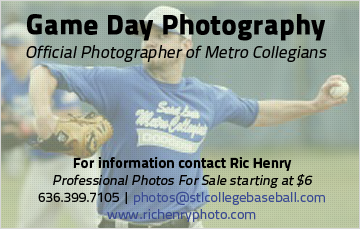 The registration fee for the St. Louis Metro Collegiate Baseball League is $725 per player. A nonrefundable deposit of $100 is required for acceptance of a player application, (due within 10 days of your acceptance email) with the balance due by May 4, 2019. A late fee of $100 shall be applied to any accounts not paid in full by May 4, 2019. All registration fees, once tendered, are nonrefundable. An exception is made for players who are selected in the MLB draft and sign a player contract with that MLB team in the month of June. Upon receipt of the player's complete uniform and a copy of his signed contract with MLB, the Metro board shall refund two-thirds of the registration fee.